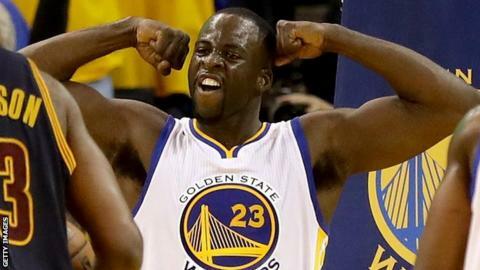 Draymond Green scored 28 points as Golden State beat Cleveland 110-77 to take a 2-0 lead in the NBA Finals. Stephen Curry added 18 points and nine rebounds but played just 25 minutes as the defending champions took control of the best-of-seven series. Cleveland's cause was not helped when Kevin Love was forced to leave the game feeling dizzy after taking a blow to the head in the second quarter. "They beat us pretty good tonight," said Cavaliers talisman LeBron James. He finished with 19 points, nine assists and eight rebounds but did not play in the fourth quarter once the Warriors had opened up a big lead. Golden State beat Cleveland in last year's Finals and have now beaten the Cavs seven straight times. They won game one 104-89. The series now switches to Cleveland after the first two games took place in Oakland, the home of the Warriors.